Multi-platinum selling singer-songwriter Adele will perform the Oscar-nominated theme song from the 23rd James Bond movie, Skyfall, at the 85th Academy Awards, the show’s producers announced today. “Skyfall,” from the film of the same name, was announced as a nominee for Original Song at the Academy’s Nominations Announcement on January 10. 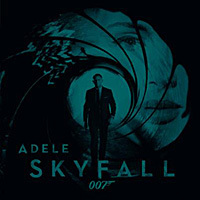 The song, written by Adele and Paul Epworth, is the first Bond theme ever to debut in Billboard’s Top 10 and the first to be nominated for an Oscar since “For Your Eyes Only” in 1981. Oscar.com celebrates Adele’s performance with a special gallery of some of the most memorable James Bond theme songs through the years. You can check it out here.